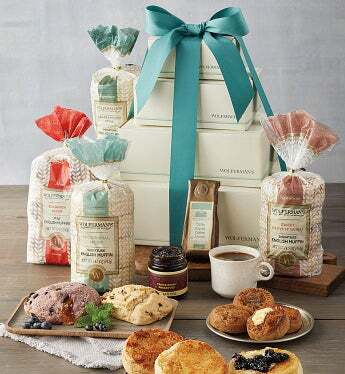 The Signature Bakery Tower delivers a selection of classic favorites for everyone to gather around and enjoy. It starts with extra-tasty English muffins in a variety of flavors and sizes. Spread some preserves over a toasty muffin and fill all of the tiny air pockets with fruity goodness. Serve up some blueberry scone slices, along with robust Tiffin coffee, for an easy gourmet spread. These irresistible bakery delights are a delicious way to start the morning or snack throughout the day. The Signature Bakery Tower delivers a selection of classic favorites for everyone to gather around and enjoy. it starts with extra-tasty English muffins in a variety of flavors and sizes. Spread some preserves over a toasty muffin and fill all of the tiny air pockets wirh fruity goodness. Serve up some blueberry scone slices, along with robust Tiffin coffee, for an easy gourmet spread. These irresistible bakery delights are a delicious way to start the morning or snack throughout the day.